This article is about the Joseph Smith Papers Project publications. For the TV series, see The Joseph Smith Papers (TV series). The Joseph Smith Papers (or Joseph Smith Papers Project) is a project researching, collecting, and publishing all manuscripts and documents created by, or under the direction of, Joseph Smith, Jr., the founder of the Latter Day Saint movement. The documents, which include transcriptions and annotations, have been published both online and in printed form. The project is sponsored by the Church History Department of The Church of Jesus Christ of Latter-day Saints (LDS Church), while the website and volumes are published under the department's imprint, the Church Historian's Press. After Joseph Smith's death in 1844, a collection of his papers was carried West by Brigham Young and other church leaders. Some significant documents remained with John Whitmer, Smith's widow Emma, and others. Many of these were not published until years later by the LDS Church, the Community of Christ, and independent researchers. The "Roots of the current effort" began in the late 1960s when Truman G. Madsen invited Dean C. Jessee, then an employee of the Church Historian's Office, to contribute documents relating to Joseph Smith and early Mormonism to issues of BYU Studies. In 1972 Leonard J. Arrington was appointed the Church Historian and he directed Jessee to continue to "locate, collect, and transcribe Smith's writings." This resulted in Jessee's 1984 publication, The Personal Writings of Joseph Smith followed by the two volume Papers of Joseph Smith, the first in 1989 and the second in 1992. In 2001, Dean Jessee's project became a joint venture between Brigham Young University's Joseph Fielding Smith Institute and the LDS Church Archives. The project was renamed The Joseph Smith Papers and expanded with added funding from Larry H. and Gail Miller. Its preliminary work was important to the creation of the landmark biography, Joseph Smith: Rough Stone Rolling, which Richard Bushman published in 2005. In August 2004, the Project received endorsement by the National Historical Publications and Records Commission, a division of the National Archives, to ensure research is conducted according to the highest scholarly standards. The Project was moved back to the Church History Department in 2005. Although not an official part of the project, a documentary TV series also called The Joseph Smith Papers was created. This series documented the creation of and work involved in the Joseph Smith Papers Project. It was produced by KJZZ-TV in cooperation with the LDS Church History Department. In February 2008, The Church Historian's Press, an imprint of the Church History Department of the LDS Church, was established "for publishing works related to the Church's origin and growth." The publication of The Joseph Smith Papers is the press's initial project. Marlin K. Jensen, Church Historian and Recorder at the time of the announcement, said the project will include "journals, diaries, correspondence, articles and notices. Everything of a written nature Joseph Smith generated, or over which he had oversight." High resolution images of many of the original documents were published by Brigham Young University Press in 2002 as part of Selected Collections from the Archives of The Church of Jesus Christ of Latter-day Saints. The two volume set contains 76 DVDs of images from 1830 to 1923, including complete images of the Joseph Smith Collection, circa 1831-1844, the Revelations Collections, circa 1831-1876, architectural drawings of the Nauvoo Temple, and several volumes containing minutes from meetings Joseph Smith attended or oversaw. Annotated transcriptions of the Joseph Smith related document from this DVD collection, in addition to the number of Joseph Smith documents housed in widespread repositories and in private collections will make the documents far more accessible to scholars of American religious history, historians, researchers, and the public. Before publication, transcripts of the manuscripts are verified three times, and annotation is supplied to illuminate the historical context of each document.." To assure quality, all citations and footnotes are verified, often double-checked, by production editors and carefully copy edited. The manuscripts are also examined by editors over the project, and drafts of volumes are reviewed by external scholarly reviewers and General Authorities of the LDS Church. 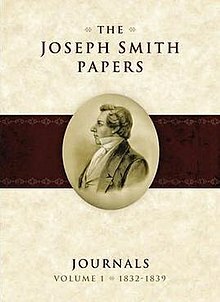 The first volume of The Joseph Smith Papers, entitled, The Joseph Smith Papers, Journals, Volume 1: 1832–1839, was released in December 2008. Despite the $50 retail price, unexpectedly high demand caused the initial printing of 12,500 copies to sell out in two weeks, and the publishers to triple their projected second printing order to 16,500. Many Christmas purchasers bought gift certificates for the coming printing and some extant copies were resold for over twice the retail price. As of October 10, 2009 over 48,000 copies of volume 1 were sold. The second volume of The Joseph Smith Papers, entitled The Joseph Smith Papers: Revelations and Translations, Volume 1: Manuscript Revelation Books was available for purchase September 23, 2009. The original sales projection for this volume was 3,000 copies. Within two weeks, over 6,100 copies were sold in Deseret Book retail stores and over 11,000 copies were requested by other bookstores. The ten journals kept by Joseph Smith and his scribes from 1832 to 1844. Correspondence, sermons and other addresses, official declarations and pronouncements, editorials and articles from periodicals, early versions of revelations, and "selected minutes and proceedings." Twelve volumes are projected for the print edition, of which 7 have yet been published. Several hundred documents from this series are available on the Joseph Smith Papers website. Planned to contain Joseph Smith's complete manuscript history, begun by Smith in 1838, and continued by clerks after his death in 1844. According to the website, "the entire multivolume manuscript history" will be published online. The series will contain legal papers in which Smith was a judge, witness, plaintiff or a defendant, and financial records including land transactions and "accounts of church-owned businesses." Only one volume is projected, which may have originally been intended for printing, but will only be available online. This series will contain the earliest known manuscripts text of revelations received by Joseph Smith and published in his lifetime including the printer's manuscript of the Book of Mormon, the published Book of Mormon, and the Book of Commandments. The Administrative Records series will publish records relating to the "institutions that were established under Smith's directions" as well as minutes for meetings Smith attended. Volume Co-editors Mason K. Allred, Mark Ashurst-McGee, Alexander L. Baugh, Christopher James Blythe, Gerrit Dirkmaat, David W. Grua, Karen Lynn Davidson, Steven C. Harper, William G. Hartley, Andrew H. Hedges, Christian Heimburger, Elizabeth A. Kuehn, Gordon A. Madsen, Spencer W. McBride, Max H. Parkin, Brenden W. Rensink, Brent M. Rogers, Royal Skousen, Alex D. Smith, Grant Underwood, Jeffrey N. Walker, John W. Welch, David J. Whittaker, Robert J. Woodford. Production Editors R. Eric Smith, senior editor, Linda Hunter Adams, Susan Hainsworth, Rachel Osborne, Sarah Gibby Peris, Heather Seferovich, Nathan N. Waite. In 2008, Journals, Volume 1: 1832-1839 received the Special Award in Textual Criticism and Bibliography from the Association for Mormon Letters., and the Steven F. Christensen Best Documentary Award from the Mormon History Association in 2009. ^ "About the Project". The Joseph Smith Papers website. The Church of Jesus Christ of Latter-day Saints. Retrieved 24 May 2011. ^ Walch, Tad (April 4, 2005). "Miller funding Joseph Smith project". Deseret Morning News. Salt Lake City, Utah. Retrieved 2008-12-02. ^ Bushman, Richard (2007). Joseph Smith: Rough Stone Rolling. Knopf. p. xxii. ^ "Publications Projects Endorsed by the National Archives". Retrieved 2008-12-03. ^ Choate, Amy (August 12, 2004). "Joseph Smith research gets top endorsement". Deseret Morning News. Retrieved 2008-12-03. ^ Elaine Jarvik (4 November 2007). "TV show to preview Smith Papers Project". Deseret News. Retrieved 6 October 2010. ^ a b c "New Publishing Imprint Set to Boost Mormon Scholarship". Salt Lake City, Utah: The Church of Jesus Christ of Latter-day Saints. February 25, 2008. Retrieved 2008-12-02. ^ "Selected Collections from the Archives of The Church of Jesus Christ of Latter-day Saints (Volumes One and Two)". Brigham Young University Press. Retrieved 2009-02-26. ^ "Landmark Publication Launches: Inaugural Volume of Joseph Smith Papers Now Available". The Church of Jesus Christ of Latter-day Saints. Retrieved 2008-12-03. ^ Arave, Lynn (December 9, 2008). "New Joseph Smith book sells out quickly". Deseret News. Salt Lake City, Utah. Retrieved 2008-12-30. ^ a b "Purchase Our Published Volumes". josephsmithpapers.org. The Church Historian's Press. Retrieved 2016-02-15. ^ R. Scott Lloyd (October 3, 2012). "Joseph Smith Papers' 'Histories' Vol. 2 released". Church News. Deseret News. Retrieved 2016-02-15. ^ Lloyd, R. Scott (November 17, 2011). "New Joseph Smith Papers volume covers Nauvoo period of church". Church News. Retrieved 2012-03-15. ^ Steve Evans (November 30, 2015). "Joseph Smith Papers – Journals Vol 3". By Common Consent. Retrieved 2016-02-15. ^ a b "Joseph Smith Papers: Editorial Method". Retrieved 2011-05-27. ^ "The Joseph Smith Papers: Documents: Letters, revelations, reports of discourses, minutes, etc". Retrieved 2011-05-27. ^ Joseph Walker (September 4, 2013). "LDS Church releases new volume of Joseph Smith documents". Deseret News. Retrieved 2014-12-11. ^ R. Scott Lloyd (December 10, 2013). "Joseph Smith Papers Project Releases New Volume". Church News. Retrieved 2014-12-11. ^ R. Scott Lloyd (December 5, 2014). "Latest Joseph Smith Papers volume covers 88 historical documents". Church News. Retrieved 2014-12-11. ^ "The Joseph Smith Papers: Documents, Vol. 3 February 1833 - March 1834". amazon.com. Retrieved 2014-12-11. ^ Trent Toone (May 11, 2016). "From Kirtland to Missouri: 5 interesting notes from 'Joseph Smith Papers: Documents, Vol. 4'". Deseret News. Retrieved 2016-05-16. ^ Unknown (May 15, 2017). "Documents, Volume 5: October 1835-January 1838". The Joseph Smith Papers. ^ Jessee, Dean C.; Esplin, Ronald K.; Bushman, Richard L.; Grow, Matthew J.; Dirkmaat, Gerrit John (2017). The Joseph Smith Papers Documents, Volume 6: February 1838-August 1839. Salt Lake City: Church Historian Press. ISBN 9781609075774. OCLC 849801109. ^ Jessee, Dean C.; Esplin, Ronald K.; Bushman, Richard L.; Grow, Matthew J.; Dirkmaat, Gerrit John (2018). The Joseph Smith Papers Documents, Volume 7: September 1839-January 1841. Salt Lake City: Matthew J. ISBN 9781609075774. OCLC 849801109. ^ "Joseph Smith Papers project releases first Histories volume". LDS Living. March 13, 2012. Retrieved 2013-06-13. ^ Press, The Church Historian’s. "The Joseph Smith Papers: Order the print volumes". www.josephsmithpapers.org. Retrieved 2018-10-10. [...] a sixth series, Legal, Business, and Financial Records, will be published online. ^ "About The Volumes". The Joseph Smith Papers. Retrieved 2009-02-25. ^ a b Trent Toone (August 5, 2015). "LDS Church announces publication of the printer's manuscript of the Book of Mormon". Deseret News. Retrieved 2015-08-22. ^ Revelations and Translations, Volume 4: Book of Abraham and Related Manuscripts. Utah: The Church Historian's Press. 2018. ISBN 978-1-62972-480-5. ^ Grow, Matthew J.; Esplin, Ronald K.; Ashurst-McGee, Mark; Dirkmaat, Gerrit John; Mahas, Jeffrey D., eds. (2016). Administrative Records, Council of Fifty, Minutes, March 1844–January 1846. Salt Lake City, Utah: Church Historian's Press. ISBN 9781629722429. OCLC 939911194. ^ "Project Organization". The Joseph Smith Papers. Retrieved 2009-02-21. ^ "AML Awards:Special Award in Textual Criticism and Bibliography". Association for Mormon Letters. Retrieved 2010-04-18. ^ "MHA 2009 Award Winners". Mormon History Association. Retrieved 2010-04-18. Jessee, Dean C.; Esplin, Ronald K.; Bushman, Richard Lyman (2008). "The Joseph Smith Papers, Journals, Volume 1: 1832–1839". Salt Lake City: The Church Historian's Press. . This page was last edited on 24 February 2019, at 10:08 (UTC).